There are so many skin treatments on offer these days it can get a bit overwhelming. So much to choose from it can make our head spin! Many people are unsure about the difference between PRP facials, face peels and Microdermabrasion. All these technical names. What do they all mean? Many questions arise such as, what exactly do they involve, are they safe, what are they used to treat and which one will best suit my needs? I decided to do some research and share my findings with you below. What does it stand for? Platelet Rich Plasma Treatment. It is a revolutionary new treatment which uses your own nutrient rich blood to rejuvenate the skin. The plasma component of the blood is separated and re-injected into your skin. This treatment may also be known as the ‘Dracula Facial’, hence the extraction and use of your own blood. It is a versatile treatment and can be injected anywhere in the body combined with dermal fillers, vitamins, amino acids and anti-oxidants. It might be described as a non-surgical facelift with long lasting rejuvenating results. People have reported their skin feeling tight and radiant afterwards. It is an easy and natural safe option which can also be used alongside other therapies. It is a procedure in which safe chemicals are applied to the skin by a professional after having been pre cleansed. The chemicals penetrate dead skin cells and stimulate the regeneration of a new epidermis. A warm sensation may be produced which last about 5-10minutes, followed by a tingling or slight stinging sensation. After this a mask maybe used and will give a cooling effect. Some patients may experience slight redness afterwards, which usually fades in time.So what are the benefits? Chemical peels provide significant improvements to the skin by softening wrinkles, minimising fine lines, restoring blotchy sun damaged skin and giving a more youthful look. It can also help acne and correct pigmentation problems such as age spots. Are Chemical Peels Safe? Adverse reactions are rare, but some mild irritation, redness or peeling may occur. Stronger peels on the whole take a bit more recovery time. It is important to follow the doctor’s instructions for pre and post care to minimise any potential side effects. 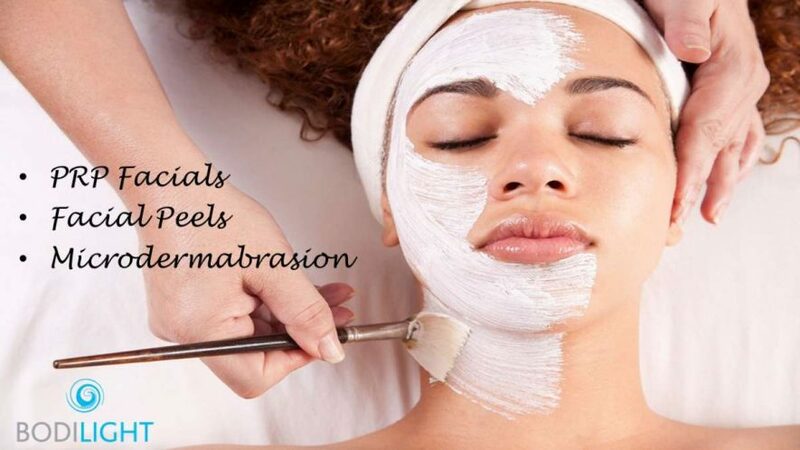 Microdermabrasion can be described as a type of skin polishing, where the skin is mechanically exfoliated with micro-crystals. It stimulates the production of new skin cells and collagen, giving your skin a more youthful look. It can be used to treat fine lines, acne scars, age spots and uneven pigmentation. Some patients may experience mild redness, minor irritation or dryness which all calms down relatively quickly. So are they safe? Reactions are pretty rare although some may experience some pain or discomfort, redness and peeling which usually fades in time. A sunscreen of SPF30 + is recommended to protect you from the sun and irritants. Bodilight offers the unique Agera Rx skin peel which is non-invasive and provides amazing results, as well as PRP facials and Microdermabrasion which deliver instant astounding results. It can be confusing as to which is the best course for you. They all have the ability to achieve very appealing results and some of the benefits do cross over. Why not book a no obligation consultation with Bodilight’s skilled resident Surgical Doctor, who will advise you and create a unique and tailored plan for optimal results.